My backyard nature preserve never ceases to amaze me. 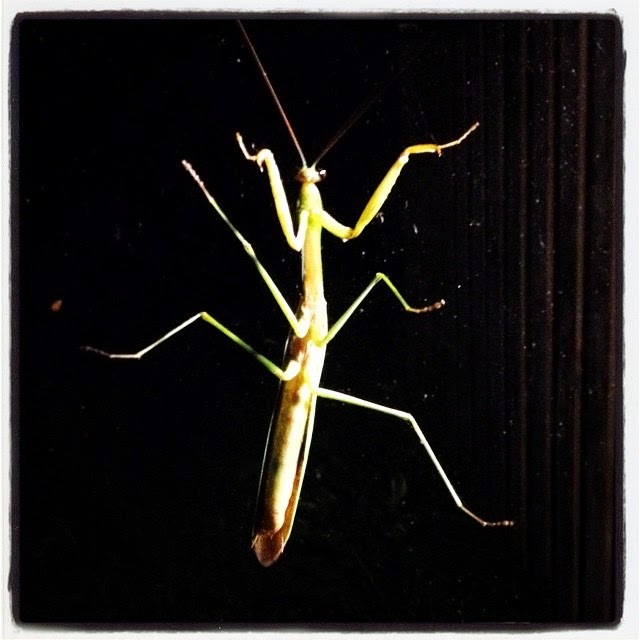 Tonight's surprise guest was a large praying mantis, which created a B-movie atmosphere and great fear among the populace of our home. These are such unusual creatures, with their size and long legs, plus their "bug" eyes, and they can be rather intimidating. 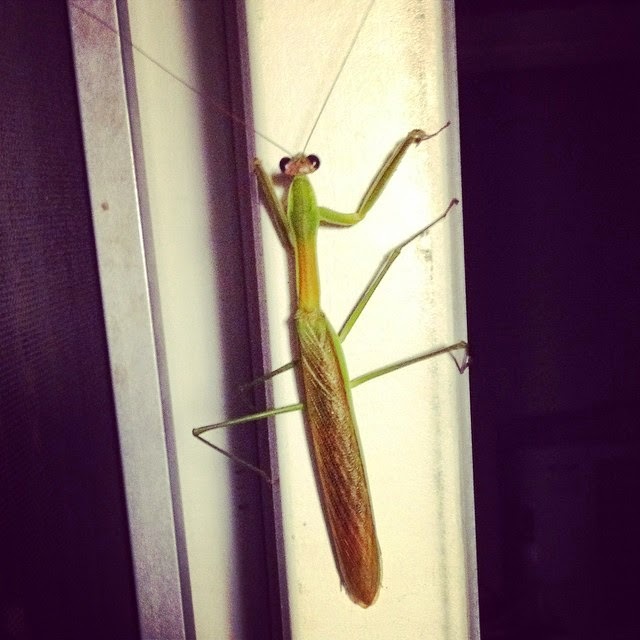 My father has a particularly great fear of these bugs, and has had his fair share of confrontations over the years. I remember one afternoon, Dad was out doing some yard work, and I noticed him just outside my bedroom window. All of sudden, I saw him jump about 5 feet in the air, and run off into the yard. I ran to window and he was doing a crazy dance in the yard, stripping off his shirt and jumping up and down. I ran up to the front porch and went outside to see what was wrong. He yelled that there was a praying mantis crawling on his shoulder, trying to attack him. Apparently, Dad had been scarred at a young age by the mere presence of one of these creatures, and that was enough to created a healthy fear that lasted into his adult years. It would be funny if he wasn't so scared. Anyway, after discovering the mantis on our back door, I let Faithful Pup Scout out into the back yard, at which point the mantis decided to dive bomb us and flew into the house. My daughter, who has inherited Dad's fear of these bugs, ran screaming out of the room. I was able to direct the mantis back out the door, and get Scout back in at the same time, saving us all from certain doom. Daughter Melody also had called her Pap (my Dad) to share the mantis' presence. Fun stuff. We know how to have a good time on a Friday night.